Hubert was a married courtier serving Pepin of Heristal, France. While on a hunting trip, he was said to have had a vision of a crucifix between the antlers of a stag. Following the death of his wife, he is believed to have entered Stavelot Monastery in Belgium, and was later ordained by St. Lambert at Maastricht. In 705 he succeeded St. Lambert as bishop and later erected a shrine for St. Lambert’s relics at Liege, France. 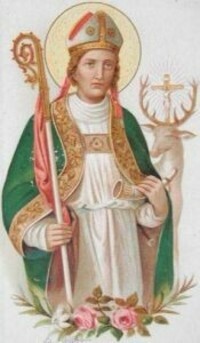 Noted for his miracles and for the conversion of hundreds, He is a patron saint of hunters. Hubert died at Teryuern near Brussels, Belgium, on May 30. His Feast day is observed on November 3. As our parish is located in the middle of fox hunting country, it is appropriately named for St. Hubert, the patron saint of hunters.